The five riders from the Monster Energy Honda Team were present at the prestigious EICMA motorcycle show in Milan, Italy. Besides visiting the team’s collaborators, the squad were there to back the launch of several of Honda’s latest models. Joan Barreda, Paulo Gonçalves, Kevin Benavides, Ricky Brabec and Michael Metge were the official Honda Racing Corporation riders in attendance at Milan’s EICMA show as the rally team came out in support of the brand. 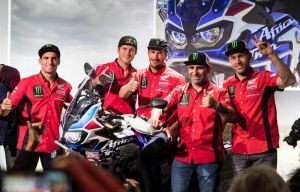 In the official presentation of both the brand new Honda models and the different top category teams, the Honda Rally team – the Monster Energy Honda Team – was the most numerous as well as the most sought-after team for press interviews. Subsequently, the riders made their presence noticed at the Honda stand where bike fans in attendance at Milan’s EICMA were able to savour the brand’s latest range of offerings, including the special model that commemorates the thirtieth anniversary of the launch of the Africa Twin, one of the marque’s most celebrated models. The team also took the opportunity to pay a visit to several of Monster Energy Honda Team’s collaborators, such as Motul, Showa, Michelin, Givi, Termignoni, Acerbis, Beta, Tucano Urbano, Supersprox and Vibram, among others.